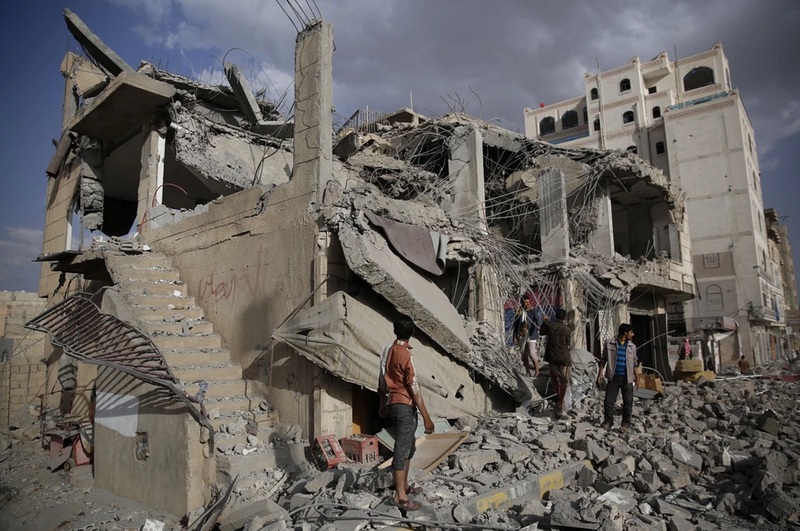 The killing fields of Yemen–now being democratized by a Saudi-led US-backed alliance of feudal monarchies & military juntas bombing it to smithereens. You can’t tell the difference between Yemen, Syria, & Gaza. The old saying that ‘politics makes strange bedfellows’ needs to be updated for the neoliberal era, the barbaric phase of capitalism. There’s nothing strange at all that the US & UK are in league with Saudi Arabia, a regime that started the new year with a mass beheading of 47 people on January 2nd & which has been bombing Yemen since March of last year. Last year, we learned of the extent of the Obama administration’s involvement in the merciless bombing with increased arms sales & logistical & intelligence support. Now we learn that under Cameron the UK increased bomb & missile exports to Saudi Arabia from £9 million to £1 billion just over three months last year. It now stands exposed that UK military advisers are sitting in Saudi war rooms providing instruction & assistance to the bombing in Yemen, using British planes & bombs targeting schools, homes, & the healthcare system. It’s reported 130 medical facilities have been taken out by bombs; 2.4 million have been driven from their homes; 14 million are “food insecure,” with half on the starvation point & no access to clean water or sanitation; nearly 19 million out of 24 million Yemenis are now dependent on humanitarian aid for survival–with no report on how much aid is actually being delivered in the middle of a killing field. Saudi Arabia doesn’t have the lock on barbarism. The bombing has killed an estimated 6,000 Yemenis. Some reports say half of them are civilians; other reports claim an estimated 93 percent are civilians. Who the hell would the others be? There are reports of 10,000 Saudi ground troops & thousands of mercenaries deployed by the United Arab Emirates but no reports about the Yemeni military in the field. A UN panel investigating the bombing campaign issued a 51-page report exposing “widespread & systematic” attacks on civilian targets & raising questions about the role of the British military advisers. The UN also says the naval blockade & bombing have created a “humanitarian catastrophe” in Yemen & involve violations of international humanitarian law. Well what about some UN sanctions then against the Saudi coalition, the US & UK–like they imposed on Iraq to justify US bombing? The people in this photo are inspecting a house in Sana’a, Yemen which was destroyed by a Saudi bomber made in Britain under the direction of British advisers using US intelligence. End the bombing in Yemen! Forgive me for not thinking Noam Chomsky a god & daring to disagree with him. Plebeian women have no such rights when even breathing air is an infringement of elite male entitlement. Yeah right! That’ll fly on my wall. If you insult me for criticizing Chomsky because I’m unworthy, imagine what vituperations you’ll unleash. I detest elitism & am not real polite about it. So don’t push your luck if that’s your schtick. BDS was part of the plot line on “The Good Wife” episode tonight. It was awkwardly presented & somewhat confusing, but the character Diane Lockhart legally defended a student who wrote an article about the boycott of Israel after the school defunded the student newspaper for publishing it. It was surprising they didn’t have the author morph into a terrorist which is how they usually portray Arabs & Muslims on these shows. There are a few video reports circulating on social media about the announcement by Rula Ghani, the wife of Afghanistan’s president, that the first university for women will open in Kabul. The video mentions the repression of women’s education under the Taliban, does not mention the devastation of women’s lives under US occupation & bombing, & makes a point of saying Ghani is a Christian in a country that is 99.7 percent Muslim. Does anyone else get the stinking whiff of Islamophobia?